Today, Cabinet Secretary of the Ministry of Agriculture, Livestock & Fisheries Hon. 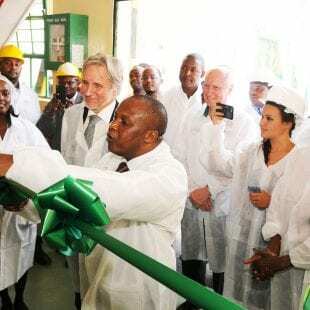 Willy K. Bett, EGH, officially opened the Unga Holdings Ltd fish feed factory in Nairobi, Kenya. Alongside the Chairman of the Board of Seaboard Corporation and Frans Makken, the ‎Netherlands Ambassador to Kenya. The factory has the capacity to produce 5,000 tons of high quality extruded floating fish feed annually for the East African market. It is the first facility of such level of quality in East Africa that will produce the much needed high-quality floating fish feeds, the single most important impediment to the growth of the aquaculture (fish farming) sector in the region. High-quality feed enable fish farmers to increase their output and lower their production costs per kg. Currently, the supply gap for fish increases rapidly as fish stocks in Lake Victoria have been dwindling due to overfishing and a growing population. This leads to a demand for affordable and healthy animal protein. Unga Holdings Ltd –manufacturer of human nutrition and animal nutrition products and joint venture of Unga Group Ltd and US-based Seaboard Corporation – developed the factory within the framework of the Dutch Public Private Partnership FoodTechAfrica. This partnership is initiated and coordinated by Larive International and has been working on the development of the entire aquaculture value chain in East Africa since 2013. The partnerships consists of 14 public and private partners, each offering complementary skills and expertise. Dutch partners Ottevanger Milling Engineers and Almex Extrusion designed and manufactured the facility’s state-of-the-art equipment. Global animal feed player Nutreco has entered into a commercial agreement with Unga and provides in-depth knowledge and expertise on feed formulation, production and marketing. The Dutch Ministry of Foreign Affairs provides co-financing to the consortium’s activities. Wouter van Vliet and Menno Morenc are currently with the FoodTechAfrica project team in Kenya for the opening. They are happy with this step bold forward. Follow the progress of the team in Nairobi at Twitter, Wouter’s blog and the Kenian newspapers.